Others refer to a "spiritual heritage". Whatever you wish to call it, I have history with the Vineyard movement. And this past October, I had an opportunity to revisit some of those roots. John & Kathleen Baker, friends who go way back, suggested over coffee at a local St. Arbucks that we should go. It had been just under two decades since I last attended one of the annual Regional Gatherings for Vineyard pastors in British Columbia. Which, to the surprise of absolutely no-one, coincides with the last time we were pastors in a Canadian Vineyard (1997). But there's a new sheriff in town -- oops, I mean new National Directors -- David & Anita Ruis, and they were kind enough to ratify the Bakers' invitation and include me in the Gathering. "At heart, you're Vineyard, and this is where you belong," said Anita. "I consider you a part of the tribe, anyway," said David. "Hey, why don't you come a day early for the Leaders' forum, too?" 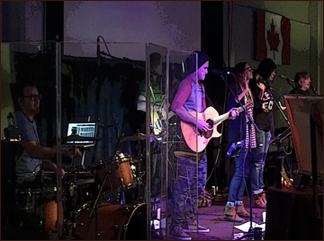 There are many reasons to be glad that David & Anita are now the National Directors of Vineyard Canada, and one of them is their ability to make people feel welcome and valued. The worship ethos of the conference was also familiar territory, and it was nice to not be onstage for a change, but simply part of the gathering. And there are some great new voices in the broader worship community joining together with the seasoned (grizzled?) worship leaders. And I really appreciated the prayer times together. One of the things I have missed over the years has been the classic "dialed down" (non-hype) prayer ethos in the Vineyard movement. And it was encouraging to see that original dynamic coming back. In fact, much of the weekend was focused on recapturing the good roots of the Vineyard. Not living in the past, wallowing in nostalgia -- but rather, looking forward to the future by digging deep into the roots. It was very refreshing to encounter friends I hadn't seen for years: catching up, hanging out, and praying together. And considering how long it had been, it was remarkably easy to join in, whether during worship or prayer times. Like falling off a bicycle, I guess; you never really forget how. For the record, I didn't see anyone falling for any reason, nor were any bicycles harmed in the holding of this Gathering. There is something very encouraging, very life-giving, and very right, about re-visiting some of your spiritual roots, and finding a warm welcome that invites you to re-connect, join in, and enjoy good times together, even if you're not "officially" a part of the tribe. Thanks, John & Kathleen, for inviting me, and thanks also to David & Anita, for making space for me. I value my roots, and my extended (Vineyard) family.